Ballet classes anywhere in the world add elegance and expertise to the skill of already great dancers, but receiving that ballet instruction in Chicago is even better. This is because of our world class ballet schools, which in turn are powered by world class ballet instructors! There are very few places on the planet that offer pre-professional ballet instruction as fine as that which you'll find in Chicago. If you're coming into the Windy City to study dance, chances are you have already heard of the two schools that we mention on this page: Joffrey Ballet School Chicago and Ballet Chicago. Each one has built an unshakable reputation for themselves, and either one of those will be an excellent choice for you. All that's left to do is find out more about them and make your choice. Each school is detailed below, and we have also included links to the schools' websites so that you can find out even more about what they have to offer an aspiring student like yourself. You will find information on each academy's programs, plus each school's strengths and highlights. Everything you need to know is below! If you aspire to be a professional dancer performing in renowned venues across the globe, or to be an instructor passing on the gift of dance to the next generation, there are no better schools than the two below at which to receive your training in the art of ballet. Should your ultimate career goal lie outside of dance, you can still learn valuable skills here, including but certainly not limited to discipline, confidence, and creativity. Children and adults alike will grow and flourish under the watchful guidance of each academy's incredible instructors. We highly recommend either one of the schools below! Though many know it as Joffrey Ballet School Chicago, the official name of the Joffrey Ballet's official school is The Academy of Dance. There is no other ballet school in our city that holds such an esteemed reputation amongst dance professionals. They accept students of all ages and all levels, so there is nothing barring you from receiving the absolute best ballet education that you can possibly find. Complete information about The Academy of Dance, The Official School of the Joffrey Ballet, can be found online at www.joffrey.com, in person at 10 East Randolph Street, or by telephone at 312-739-0120. 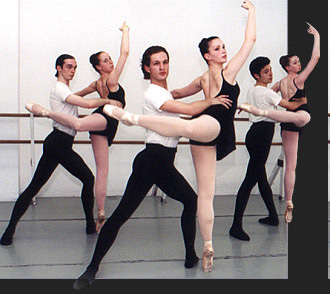 Ballet Chicago is highly regarded in the array of ballet schools in our city, and is focused on the Balanchine technique, established of course by George Balanchine. The environment here is nurturing and confidence-building, with a heavy focus on technique to prepare the students for a professional career in dance. Complete information about Ballet Chicago can be found online at www.balletchicago.org, in person at 17 North State Street, 19th Floor, or by telephone at 312-251-8838.